The Jamaica Stock Exchange pulled back at the close of trading on Friday as declining stocks was 60 percent more than as those advancing to end a week that had 2 days of new record close and still ended the week 2,561 points ahead of the close of the previous week. At the close of trading, the All Jamaican Composite Index declined 471.19 points to 333,056.79 while the JSE Index slipped 429.31 points to close at 303,452.35. Just 26 securities traded on Thursday, resulting in 9 advancing, 15 declining and 2 remaining firm resulted in activity amounting to just 2,827,566 units valued at $112,242,230. In market activity, Berger Paints fell 50 cents and ended at $20.50, with 102,177 stock units, Carreras lost 28 cents in concluding trading at $10, with 171,700 units, Caribbean Cement jumped $2 to $42 while trading 289,511 shares, Ciboney Group rose 1 cent to settle at 13 cents, trading 100,000 shares, Grace Kennedy gained 50 cents and ended trading at $50.50, with 5,120 shares. 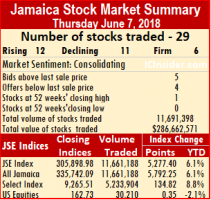 Jamaica Broilers declined by 90 cents, trading 25,789 stock units to end at $22.10, with, Jamaica Producers gained 10 cents and finished trading at $16.95, with 1,654 units, Jamaica Stock Exchange closed at $7.20, with 2,500 shares after rising 17 cents, JMMB Group ended at $29.45, trading 219,128 shares with a rise of 45 cents. Kingston Properties fell 35 cents concluded trading at 52 weeks’ low of $5, with 6,000 shares, Kingston Wharves fell 35 cents and finished at $45.65, with 26,730 stock units changing hands, Mayberry Investments shed 44 cents and settled at $6.06, with 26,247 units, NCB Financial Group shed 49 cents and ended trading at $99.50, with 766,949 shares. 1834 Investments traded at $1.09 after rising 3 cents with 30,000 shares changing hands, 138 Student Living lost 8 cents and settled at $4.60, with 1,000 units, PanJam Investment closed at $51.45, with 27,225 stock units, Portland JSX lost 87 cents to end at $9.25, with 10,000 units, Radio Jamaica finished at $1.05, with 71,058 shares. Sagicor Group settled at $38.15 and lost 95 cents after trading 73,246 shares, Sagicor Real Estate Fund eased 1 cent and settled at $13.79, with 14,201 shares. Scotia Group rose 57 cents in closing trading at $50.60, with 46,014 units, Sterling Investments dropped $2.50 and closed at $9.50, with 591 shares, Supreme Ventures lost 30 cents and ended at $14.20, with 72,325 shares. Victoria Mutual Investments concluded trading with a fall of 10 cents at $4, exchanging 568,164 stock units and Wisynco Group rose 4 cents, finishing at $9.84, with 169,237 units. In the main market preference segment, JMMB Group 7.5% lost 4 cents and finished at $1.04, with 1,000 stock units changing hands. 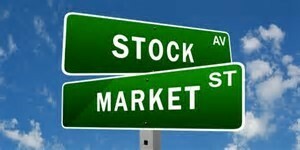 The Jamaica Stock Exchange closed on Wednesday with modest volumes, but the market indices moved to new record close. At the close of trading, the All Jamaican Composite Index rose 686.42 points to close at 336,693.61 and the JSE Index climbed 625.40 points to 306,765.91. Just 22 securities traded on Wednesday, resulting in 10 advancing, 7 declining and 5 remaining firm resulted in 2,236,723 units valued at a mere $34,192,073 trading. In market activity, Barita Investments closed at $12.05, with 1,730 shares trading, Berger Paints gained 51 cents and ended at $20.51, with 3,000 stock units changing han Carreras concluded trading at $10.30, with 39,046 units, Caribbean Cement jumped $2.50 to finish at $42, with 23,000 shares, Ciboney Group settled at 12 cents, with 50,000 shares. Grace Kennedy rose $1, ending trading at $51, exchanging 26,789 shares, Jamaica Broilers rose 20 cents to $23, with 2,100 stock units, Jamaica Producers finished trading at $16.85, with 14,960 units, Jamaica Stock Exchange closed at $7.30, trading 43,660 shares. JMMB Group ended with a loss of 65 cents at $27.60, trading 358,700 shares, Kingston Properties dropped 65 cents and concluded trading at $5.35, with 2,400 shares, Kingston Wharves fell 50 cents and finished at $46, with 61,766 stock units, Mayberry Investments settled with a gain of 10 cents at $6.50, trading 2,090 units. 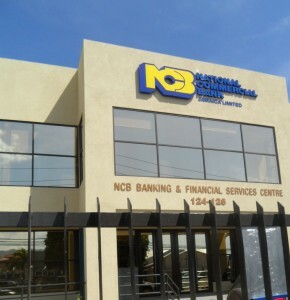 NCB Financial Group rose 25 cents and ended trading at $98.25, with 20,462 shares, PanJam Investment closed with a fall of 5 cents at $51.45, exchanging just 200 stock units, Radio Jamaica eased just 1 cent and finished at $1.07, with 104,000 shares trading, Sagicor Group settled with a loss of 70 cents at $38.50, exchanging 21,654 shares. Sagicor Real Estate Fund added 1 cents and settled at $13.81, with 890 shares, Scotia Group rose 35 cents in trading 59,507 units to close at $51.50, Supreme Ventures ended 30 cents higher at a 52 weeks’ high of $15.30, with 9,314 shares, Victoria Mutual Investments rose 7 cents and concluded trading at $4.07, with 311,254 stock units and Wisynco Group lost 25 cents and finished trading at $9.75 with 1,080,201 units changing hands. NCB dominated trading with 5 million shares. The Jamaica Stock Exchange closed on Tuesday with a big rise in the level of trading as NCB Financial accounted for 43.8 percent and just over 5 million units of the volume traded. Trading ended with 23 securities being active on Tuesday, resulting in 10 advancing, 6 declining and 9 remaining firm as 11,446,622 units valued at $579,818,518 well up from the 3,192,844 units valued at $66,838,582 trading on Monday. 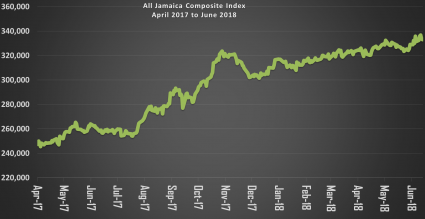 At the close of trading, the All Jamaican Composite Index climbed 3,471.47 points to close at 336,007.19 and the JSE Index advanced by 3,162.90 points to close at 306,140.51. In market activity Barita Investments closed at $12.05, after rising 5 cents with 792 shares traded, Carreras lost $1 in concluding trading at $10.30, with 210,695 units, Caribbean Cement finished with a fall of $1 to end at $39.50, trading 38,281 shares, Ciboney Group lost 1 cent and settled at 12 cents, with 221,730 shares, Grace Kennedy rose 50 cents and ended trading at $50, with 200,174 shares changing hands. Jamaica Broilers price shot up $1.20 to $22.80, with 1,005,810 stock units, Jamaica Producers finished trading at $16.85, with 5,103 units, Jamaica Stock Exchange lost 20 cents and closed at $7.30, with 130,656 shares, JMMB Group rose 25 cents and ended at $28.25, with 30,882 shares. 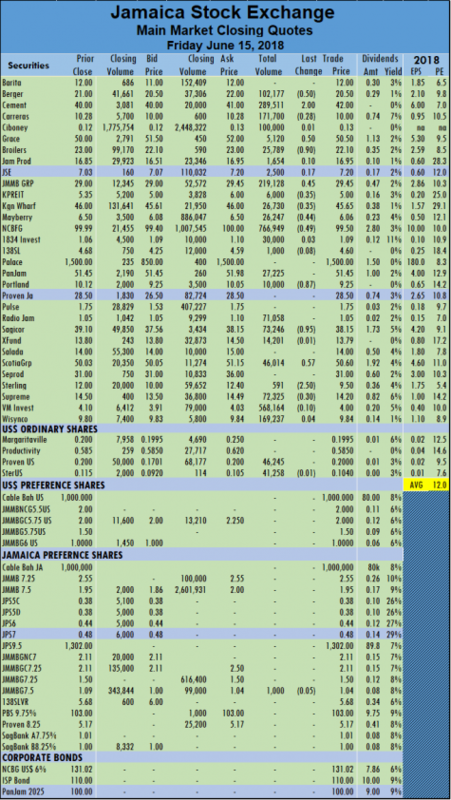 Kingston Wharves finished at $46.50, with 16,762 stock units, NCB Financial Group climbed $1 and ended trading at $98, with an exchange of 5,014,800 shares, PanJam Investment closed 50 cents higher at $51.50, with 9,211 stock units, Pulse Investments concluded trading at $1.60, with 94,707 shares. Radio Jamaica fell 2 cents and finished at $1.08, with 325,049 shares, Sagicor Group rose 20 cents to $39.20, with 153,834 shares trading, Sagicor Real Estate Fund settled at $13.80, exchanging 7,266 shares, Scotia Group lost 35 cents and closed trading at $51.15, with 53,180 units, Seprod finished trading with a rise of $1 to $36, with 272 shares. Supreme Ventures rose $1.50 and ended at $15, with 2,317,772 shares, Victoria Mutual Investments concluded trading at $4, with 583,930 stock units and Wisynco Group climbed 25 cents and finished at $10, with 136,809 units. In the main market preference segment, JMMB Group 7.25% ended at $2.11, with 180,000 shares, JMMB Group 7.5% finished at $1.09, with 708,907 stock units changing hands. Jamaica Broilers dropped $4.70 on Monday. 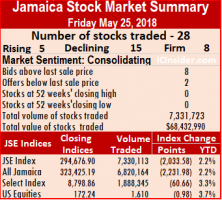 The Jamaica Stock Exchange closed on Monday with a modest recovery of some of the big losses recorded on Friday as the trading covered a wider number of securities than is the norm in recent times. 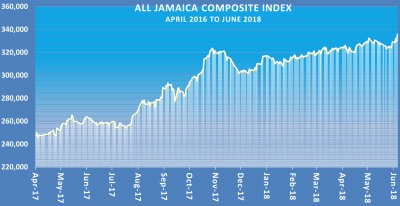 At the close of trading, the All Jamaican Composite Index climbed 1,040.26 points to close at 332,535.72 and the JSE Index advanced by 947.79 points to close at 302,977.61. A high level of 30 securities traded on Monday, resulting in 12 advancing, 9 declining and 9 remaining firm resulted in 3,192,844 units valued at $66,838,582 trading. In market activity Barita Investments rose 45 cents and closed at $12, with 3,850 shares, Berger Paints ended at $20, with 1,000 stock units, Caribbean Cement concluded trading with a rise of $1.50 to end at $40.50, while exchanging 40,980 units, Carreras closed at $10.45, with 10,900 shares, Ciboney Group closed at 13 cents, with 141,600 shares, Grace Kennedy settled at $49.50, with 7,132 shares. 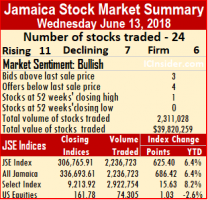 Jamaica Broilers dropped $4.70 and ended trading at $21.60, with 158,337 shares, Jamaica Producers traded 4,053 stock units at $16.85, Jamaica Stock Exchange rose 20 cents and finished trading at $7.50, with 37,018 units, JMMB Group closed 50 cents higher at $28, with 16,682 shares. Kingston Properties lost 50 cents to end at $6, with 2,100 shares, Kingston Wharves gained 50 cents in concluding trading at $46.50, with 11,018 shares, Mayberry Investments gave up 10 cents and finished at $6.40, with 29,948 stock units, NCB Financial Group rose 50 cents and settled at $97, with 55,490 units. 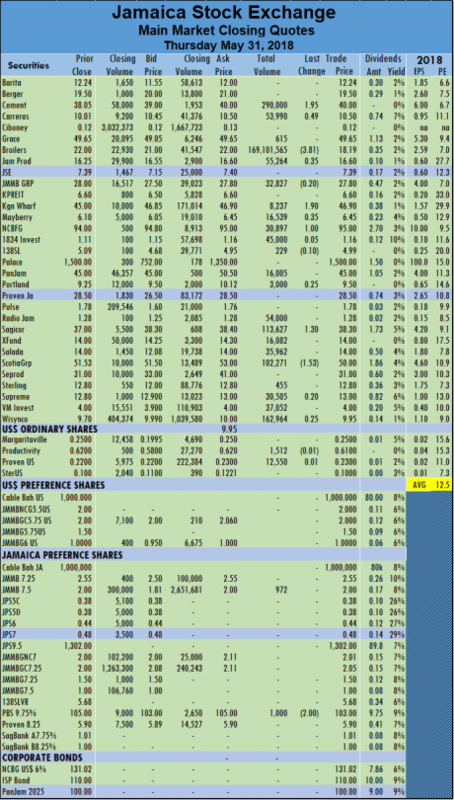 PanJam Investment fell 98 cents and finished trading at $51, with 1,079 shares, Proven Investments closed at $28.50 while 448 units traded, Pulse Investments added 19 cents and ended at $1.60, with 1,500 units, Radio Jamaica concluded trading 2 cents higher to $1.10, with 12,917 shares, Sagicor Group lost 55 cents and finished at $39, with 1,023,740 shares, Sagicor Real Estate Fund traded 5,314 units and fell 70 cents to end at $13.80. Salada Foods settled trading with 10,000 shares at $14, Scotia Group jumped $1.49 to end trading at $51.50, with 39,946 stock units changing hands, Seprod traded 8,590 units at $35, Supreme Ventures grew 50 cents and closed at $13.50, with 145,968 shares, Victoria Mutual Investments gained just 1 cent and ended at $4, with 46,455 shares and Wisynco Group concluded trading by adding 10 cents to end at $9.75, with 907,325 stock units being exchanged. 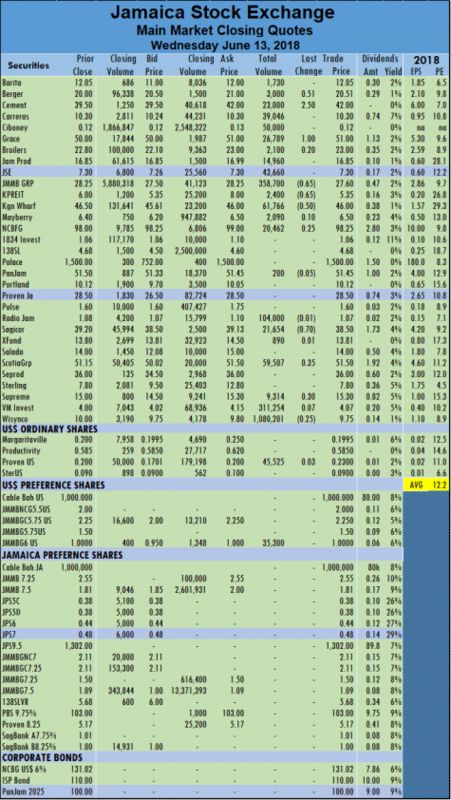 In the main market preference segment, Jamaica Money Market 7.5% rose 4 cents and finished trading at $1.85, with 40,954 units, JMMB Group 7.25% concluded trading at $2.11, with 4,500 shares, JMMB Group 7.5% gained 9 cents and settled at $1.09, with 424,000 units changing hands. The Jamaica Stock Exchange closed on Friday with a sharp retreat from record close of the indices on Thursday, even as more stocks rose than fell. At the close of trading, the All Jamaican Composite Index dived 4,246.63 points to 331,495.46 and the JSE Index dropped sharply by 3,869.16 points to 302,029.82. A total of 23 securities changed hands, resulting in 11 advancing, 6 declining and 6 remaining firm as 7,187,416 units valued at $228,155,035 traded. In market activity, Barita Investments closed down 54 cents, to $11.55, with 1,650 shares, Berger Paints gained 50 cents and ended at $20, with 8,000 stock units, Carreras fell 10 cents and finished at $10.50, with 1,575,999 shares changing hands, Grace Kennedy fell 50 cents to end at $49.50, with 3,116,194 stock units, Jamaica Broilers jumped $3.10 to a new all-time high of $26.30, with 51,790 units changing hands. 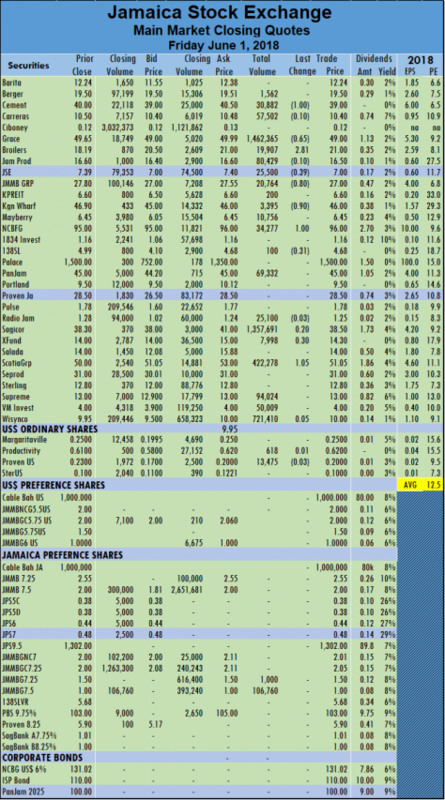 Jamaica Producers rose 40 and closed at $16.85, with a mere 125 shares, Jamaica Stock Exchange ended at $7.30, with 123,000 shares, JMMB Group concluded trading after falling $1 to close at $27.50, with 658,507 shares, Kingston Wharves settled at $46, with 2,780 units. Mayberry Investments gained 5 cents and ended trading at $6.50, with 35,000 shares, NCB Financial Group climbed $1.23 to $96.50, with 38,364 shares, PanJam Investment jumped $1.33 and ended at $51.98, with 6,155 units, Radio Jamaica settled at $1.08, with 5,921 shares. Sagicor Group ended trading with a rise of 5 cents to $39.55, while exchanging 109,852 stock units and Sagicor Real Estate Fund finished trading at $14.50, with 65,260 stock units. Salada Foods traded 10,000 units at $14, Scotia Group dropped $2.99 to finish trading 305,483 shares at $50.01, after the group posted lower profit in the April quarter. Supreme Ventures added 10 cents and settled at $13, with 800,000 shares. 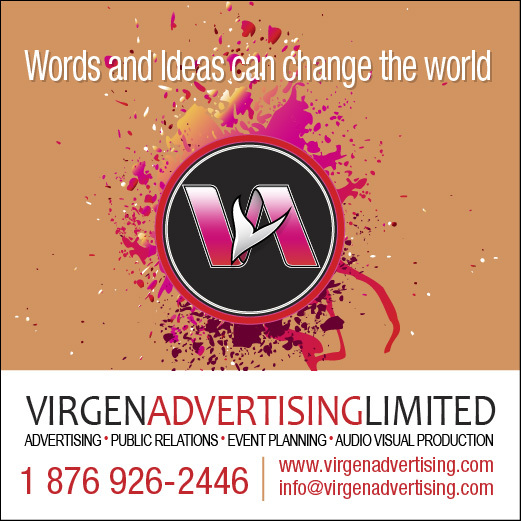 Victoria Mutual Investments ended 9 cents richer at $3.99, trading 102,912 shares, Wisynco Group gave up 15 cents in closing trading at $9.65, with 118,424 shares. 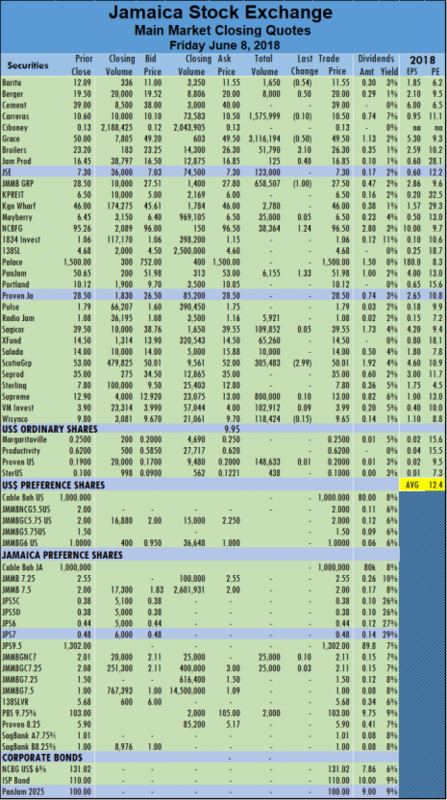 In the main market preference segment, JMMB Group 7% rose 10 cents to $2.11, with 25,000 shares, JMMB Group 7.25 % gained 3 cents and ended at $2.11, with 25,000 shares, Productivity Business 9.75% finished trading at $103, with 2,000 shares, changing hands. 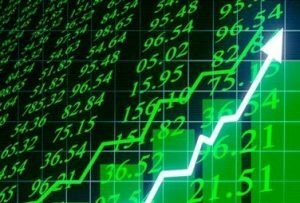 Trading closed on the Jamaica Stock Exchange on Thursday, with more than 5,000 points jump in the market indices, after crossing a series of record highs during the trading session and closed at the highest level in the market’s history. 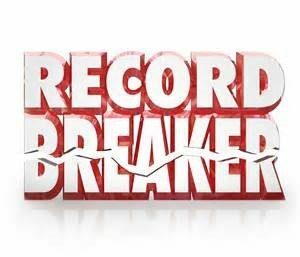 At the close of trading, the All Jamaican Composite Index surged 5,792.25 points to close at a record 335,742.09 points and the JSE Index jumped 5,277.40 points to a closing record high of 305,898.98. A total of 26 securities changed hands, resulting in 11 advancing, 11 declining and 4 remaining firm. Trading on the JSE main market ended with the overall volume and value returning to more normal levels of 4,749,951 units valued at $102,233,802 units. In market activity, Barita Investments closed at $12.09, with an exchange of 200 shares, Berger Paints ended at $19.50, with 16,000 stock units traded, Carreras closed at $10.60, with 5,130 units, Caribbean Cement gained 20 cents and finished at $39, with 47,447 shares, Ciboney Group rose 1 cent to settle at 13 cents, with 12,000 shares trading. Grace Kennedy added just 1 cent and ended trading at $50, with 2,369 shares, Jamaica Broilers traded at 52 weeks’ high of $23.20, after rising 25 cents with 10,703 stock units, JMMB Group jumped $1 and ended trading at $28.50, with 230,317 shares, Jamaica Producers lost 5 cents and finished trading at $16.45, with 24,901 units changing hands, Jamaica Stock Exchange closed with a rise of 11 cents to $7.30, trading 370 shares. Kingston Properties ended at $6.50 after falling 10 cents, with 1,800 shares, Kingston Wharves jumped $4 and concluded trading at $46, with just 500 shares changing hands, Mayberry Investments rose 44 cents to end at $6.45, with 15,504 stock units, NCB Financial Group settled 9 cents lower at $95.26, with 51,713 units. 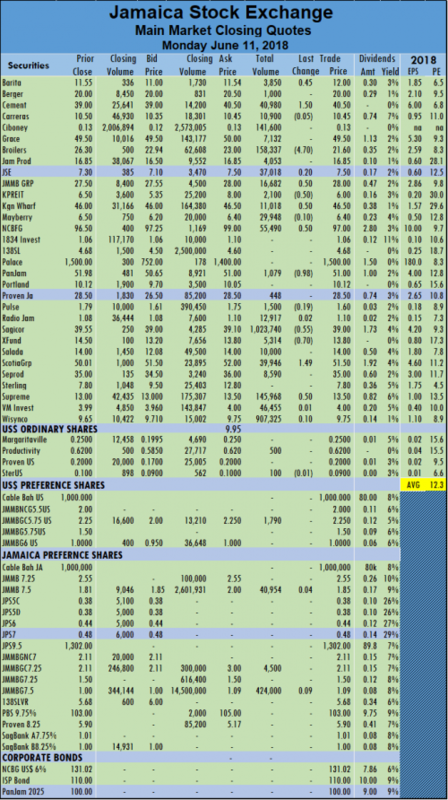 1834 Investments dropped 18 cents to $1.06, with 3,500 shares, PanJam Investment finished with a rise of 65 cents to $50.65, trading 6,300 shares, Pulse Investments ended at $1.79, exchanging 40,100 units, Radio Jamaica lost 12 and concluded trading at $1.08, with 1,800 shares. Sagicor Group lost 50 cents and ended at $39.50, trading 2,674,599 shares and Sagicor Real Estate Fund lost 50 cents and finished at $14.50, with 1,600 units. Scotia Group gained 1 cent and ended trading at $53, with 2,019,507 stock units trading, Supreme Ventures closed with 48,970 shares trading and fell 10 cents to $12.90, Victoria Mutual Investments ended at $3.90, with 442,461 shares. 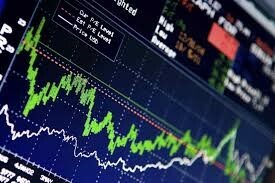 Wisynco Group concluded trading at $9.80, with 5,360,241 stock units but fell 5 cents in the process. In the main market preference segment, JMMB Group lost 1 cent and ended at $2, with 300 shares, JMMB Group settled at $1, with 642,856 units, changing hands. 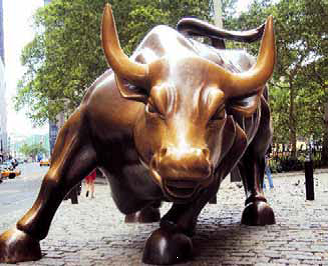 Bulls may be lurching to pounce on Jamaican stocks. Trading closed on the Jamaica Stock Exchange on Thursday with, the All Jamaican Composite Index leaped 3,607.57 points to 329,083.46 and the JSE Index surged 3,286.90 points to close at 299,832.21. A total of 23 securities changed hands, resulting in 6 advancing, 9 declining and 8 remaining firm. 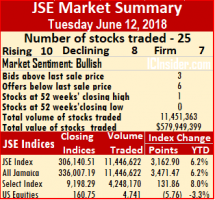 Trading on the JSE main market ended with the overall volume and value returning to more normal levels of 4,603,241 units valued at $166,353,769, from the big surge on Thursday when Jamaica Broilers pushed trading 170,209,058 units valued at $3,113,335,699. In market activity, Berger Paints ended at $19.50, with 1,562 stock units, Carreras gained 10 cents and concluded trading at $10.40, with 57,502 units, Caribbean Cement lost $1 and finished at $39, with 30,882 shares traded, Grace Kennedy fell 65 cents and ended trading at $49, with 1,462,365 shares, Jamaica Broilers recovered $2.81 to close at $21, with 19,907 stock units trading. Jamaica Producers lost 10 cents and finished trading at $16.50, with 80,429 units, Jamaica Stock Exchange closed down 39 cents to end at $7, with 25,500 shares, JMMB Group declined 80 cents and ended at $27, with 20,764 shares, Kingston Properties concluded trading at $6.60, with 200 shares. Kingston Wharves finished at $46 after falling 90 cents, with 3,395 stock units, Mayberry Investments settled at $6.45, with 10,756 units, NCB Financial Group gained $1 to end trading at $96, with 34,277 shares, 138 Student Living settled at $4.68, with a loss of 31 cents trading 100 units, PanJam Investment closed at $45, with 69,332 stock units. Radio Jamaica finished at $1.25, after falling 3 cents with 25,100 shares, Sagicor Group added 20 cents and settled at $38.50, with 1,357,691 shares and Sagicor Real Estate Fund rose 30 cents and finished at $14.30, with 7,998 units. Scotia Group climbed $1.05 in trading 422,278 stock units to close at $51.05, Supreme Ventures closed at $13, exchanging 94,024 shares. Victoria Mutual Investments ended at $4, with 50,009 shares and Wisynco Group concluded trading with a rise of 5 cents to close at $10, in the exchange of 721,410 stock units. In the main market preference segment, JMMB Group 7.25% concluded trading at $1.50, with 1,000 shares and JMMB Group finished at $1, with 106,760 stock units changing hands. Jamaica Broilers dropped $3.81 on Thursday. Trading closed on the Jamaica Stock Exchange on Thursday with, the All Jamaican Composite Index rising 1,297.53 points to 325,475.89 and the JSE Index gaining 1,182.20 points to close at 296,545.31. A total of 24 securities changed hands, resulting in 10 advancing, 4 declining and 10 remaining firm. 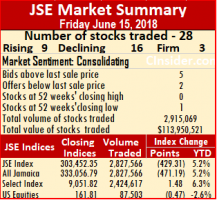 Trading on the JSE main market ended with the overall volume and value surging normal levels with 170,209,058 units valued at $3,113,335,699 changed hands. 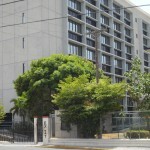 In market activity Carreras rose 49 cents and concluded trading at $10.50, with 53,990 units, C aribbean Cement jumped $1.95 to finish at $40, with 290,000 shares, Grace Kennedy ended trading at $49.65, with 615 shares, Jamaica Broilers dived $3.81 in trading 169,101,565 stock units to close at $18.19, Jamaica Producers gained 35 cents and finished trading at $16.60, with 55,264 units. JMMB Group ended at $27.80 after falling 20 cents, with 32,827 shares, Kingston Wharves climbed $1.90 to end at $46.90, with 8,237 stock units, Mayberry Investments added 35 cents to settle at $6.45, with 16,539 units, NCB Financial Group ended trading at $95 after rising $1, with 30,897 shares changing hands. 1834 Investments traded at $1.16, with 45,000 shares, 138 Student Living lost 10 cents to end at $4.99, with 229 units, PanJam Investment closed at $45, with 16,005 stock units, Portland JSX rose 25 cents and ended at $9.50, with 3,000 units, Radio Jamaica finished at $1.28, with 54,000 shares. Sagicor Group rallied $1.30 to settle at $38.30, with 113,627 shares changing hands, Sagicor Real Estate Fund settled at $14, with 16,082 shares, Salada Foods ended trading at $14, with 35,962 stock units, Scotia Group dropped $1.53 in closing trading at $50, with 102,271 units, Sterling Investments closed at $12.80, with 455 shares. Supreme Ventures ended with a gain of 20 to end at $13, with 30,505 shares, Victoria Mutual Investments concluded trading at $4, with 37,052 stock units, Wisynco Group finished at $9.95 having risen 25 cents, with 162,964 units. In the main market preference segment, Jamaica Money Market 7.5% traded at $2, with 972 stock units, Productivity Business 9.75% lost $2 in trading 1,000 shares at $103. 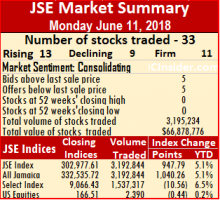 Trading on the JSE main market ended with the overall volume and value falling below normal levels on Monday as 2,736,291 units valued at over $44,287,155 changed hands. 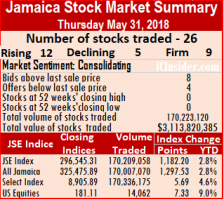 At the close, the All Jamaican Composite Index jumped 1,975.96 points to close at 325,401.15 and the JSE Index shot up 1,800.32 points to close at 296,477.22 as 28 securities changed hands, resulting in 12 advancing, 9 declining and 7 remaining firm. In market activity, Barita Investments fell 55 cents and closed at $11.54, with 15,100 shares, Berger Paints ended at $20, with 22,128 stock units trading, Carreras fell 10 cents and concluded trading at $10.45, with 127,792 units, Caribbean Cement finished at $38, exchanging 307 shares, Ciboney Group rose 1 cent and settled at 13 cents, with 45,893 shares. 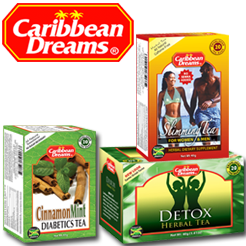 Grace Kennedy ended trading at $48.60 after rising 10 cents, with 10,193 shares, Jamaica Broilers rose 25 cents in closing at $20.25, with 51,343 stock units, Jamaica Producers fell 45 cents to finish trading at $16.25, with 1,000 units, Jamaica Stock Exchange closed with a loss of 40 cents to $7.10, in trading 700 shares. JMMB Group rose 5 cents to end at $27.05, with 38,277 shares, Kingston Wharves dropped $1 and finished at $46, with 329,678 stock units trading, Mayberry Investments settled at $6.25, after rising 25 cents with 29,780 units trading, NCB Financial Group shed 19 cents and ended trading at $94.80, with 81,775 shares. 138 Student Living settled at $5.09, after slipping 1 cents with 10,000 units, PanJam Investment added 50 cents to trade at $45, with 55,613 shares, Portland JSX closed at $10, with 4,524 stock units, Radio Jamaica rose 29 cents and concluded trading at $1.29, with 22,024 shares, Sagicor Group finished 35 cents higher at $36.50, trading 70,113 shares, Salada Foods lost $1 in settling at $14, with 10,000 shares changing hands. Scotia Group ended trading at $50.63, with 4,964 stock units, Seprod ended trading at $35, with 77,744 units, Supreme Ventures rose 40 cents and closed at $13, with 44,500 shares, Victoria Mutual Investments lost 5 cents and ended at $4, with 1,373,388 shares and Wisynco Group rose 30 cents and concluded trading at $10, with 159,255 stock units changing hands. 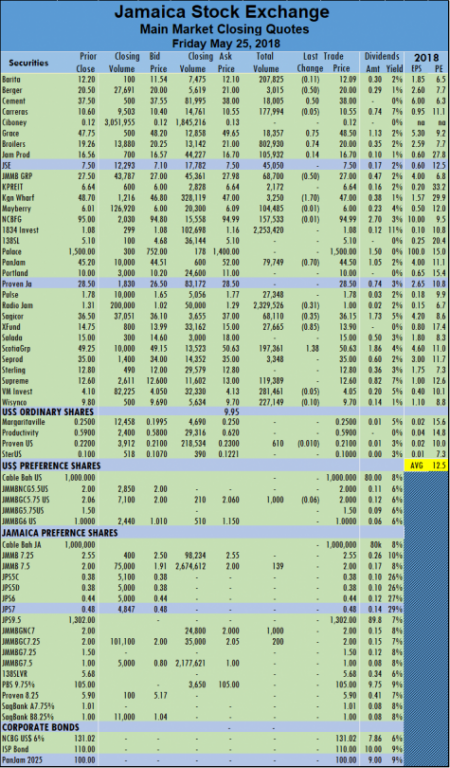 In the main market preference segment, Jamaica Money Market 7.5% traded at $2, with 500 stock units, JMMB Group 7% closed at $2.01, with 124,800 shares, JMMB Group 7.25% issued in 2019 ended at $2.05, with 24,800 shares and the older dated JMMB Group 7.25% concluded trading at $1.50, with 100 shares, changing hands. 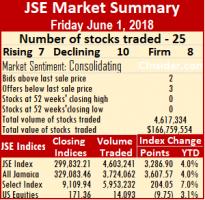 The JSE main market activity returned to more normal levels on Friday with 7,330,113 units valued at $68,164,850 changed hands, down from 28,791,979 units valued at $527,232,319 trading on Thursday. 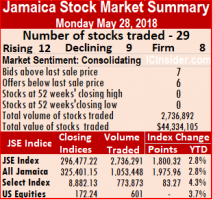 At the close, the All Jamaican Composite Index dropped 2,231.98 points to close at 323,425.19 and the JSE Index dived 2,033.58 points to close at 294,676.90 as 26 securities changed hands, resulting in 5 advancing, 14 declining and 7 remaining firm. In market activity Barita Investments fell 11 cents and closed at $12.09, with 207,825 shares, changing hands, Berger Paints shed 50 cents and ended at $20, with 3,015 stock units, Carreras lost 5 cents and concluded trading at $10.55, with 177,994 units, Caribbean Cement finished 50 cents higher at $38, with 18,005 shares, Grace Kennedy climbed 75 cents to $48.50 with 18,357 shares changing hands. 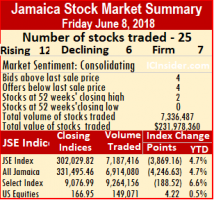 Jamaica Broilers rose 74 cents to end at $20 trading 802,930 stock units, Jamaica Producers added 14 cents and finished trading at $16.70, with 105,932 units, Jamaica Stock Exchange closed at $7.50, with 45,050 shares traded, JMMB Group lost 50 cents to end at $27, with 68,700 shares changing hands. Kingston Properties concluded trading at $6.64, with 2,172 shares, Kingston Wharves fell $1.70 and finished at $47, with 3,250 stock units, Mayberry Investments settled 1 cents down at $6, with 104,485 units trading, NCB Financial Group ended trading 1 cents lower at $94.99, with 157,533 shares. 1834 Investments traded at $1.08, with 2,253,420 shares, PanJam Investment closed at $44.50, with a loss of 70 cents trading 79,749 stock units, Pulse Investments concluded trading at $1.78, with 27,348 shares, Radio Jamaica fell 31 cents to $1, with 2,329,526 shares. Sagicor Group settled with a fall of 35 cents at $36.15, with 68,110 shares, Sagicor Real Estate Fund lost 85 cents to end at $13.90, exchanging 27,665 shares, Scotia Group added $1.38 to close at $50.63, in trading 197,361 units, Seprod finished trading at $35, with 3,348 shares, Supreme Ventures ended at $12.60, with 119,389 shares. Victoria Mutual Investments shed by 5 cents and concluded trading at $4.05, with 281,461 stock units traded Wisynco Group finished 10 cents lower at $9.70, with 227,149 units changing hands. 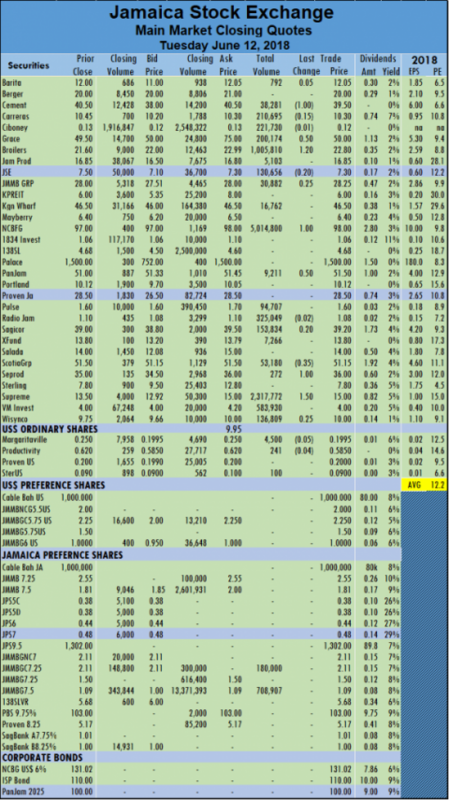 In the main market preference segment, Jamaica Money Market 7.5% traded at $2, with 139 stock units, JMMB Group 7% finished trading at $2, with 1,000 units and JMMB Group 7.25% closed at $2, after 200 shares changed hands.